Hello, and Happy St Patrick's Day! I can't say that I celebrate, but I know a lot of people do - and any excuse to do my nails! After picking up China Glaze 'Four Leaf Clover' in the U.S. over Christmas (hauled here), it had to be on my nails today. After putting it on, I ended up making up a design as I went along, adding some gold stamping. Read on to find out more! 'Four Leaf Clover' is a gorgeous vibrant green creme. I was pleasantly surprised by how pigmented it was, and nearly got it opaque in one coat. 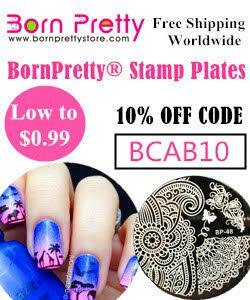 If you did a thicker coat or had shorter nails, this may be a one coater for you! Below is two coats and topcoat. This polish photographs ridiculously inaccurately. It tends to pick up a lot more blue than it is. I have edited the photo above to try and show you the true colour, although it is still more green and vibrant in real life. The original photo is shown below - I wanted to add it in for full disclosure. I had a quick look through my stamping plates for something appropriate to add and found an adorable little clover pattern on an unbranded plate (online here). I stamped the cute clover (minus the stem/string) using my new clear jelly stamper and Barry M 'Gold Foil Effect' polish. I wanted something a bit more 'full coverage' for my ring finger, so went for a wavy chevron pattern from MoYou London Sailor Plate 05 (online here). I finished with a quick coat of topcoat to seal everything in. Again the photos below are edited to show a truer colour. What do you think? For making it up as I went along, it actually came out quite well! 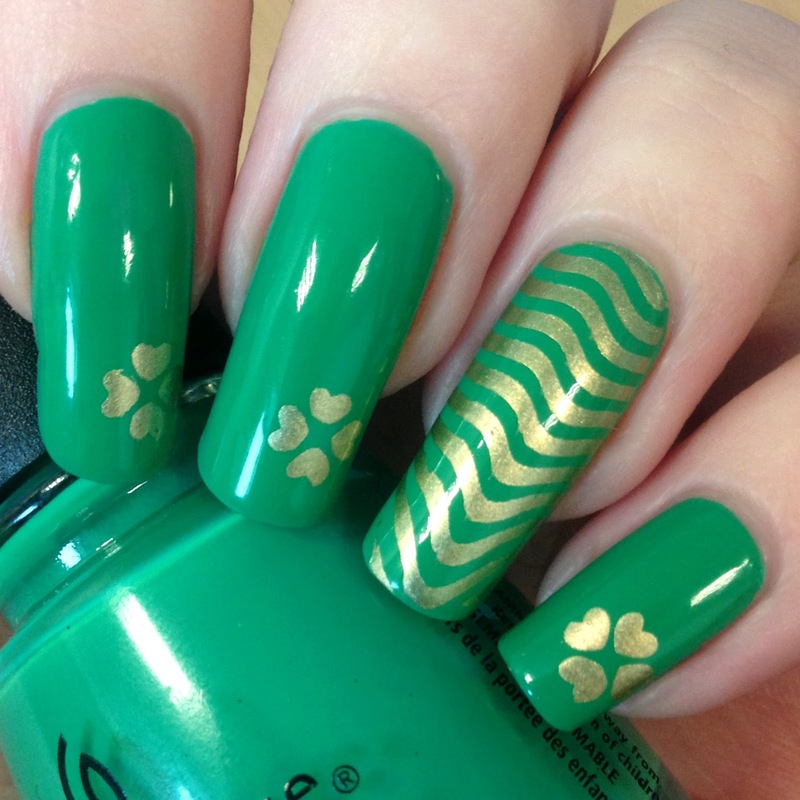 It certainly screams St Patrick's Day with both the colour combination and the clovers. 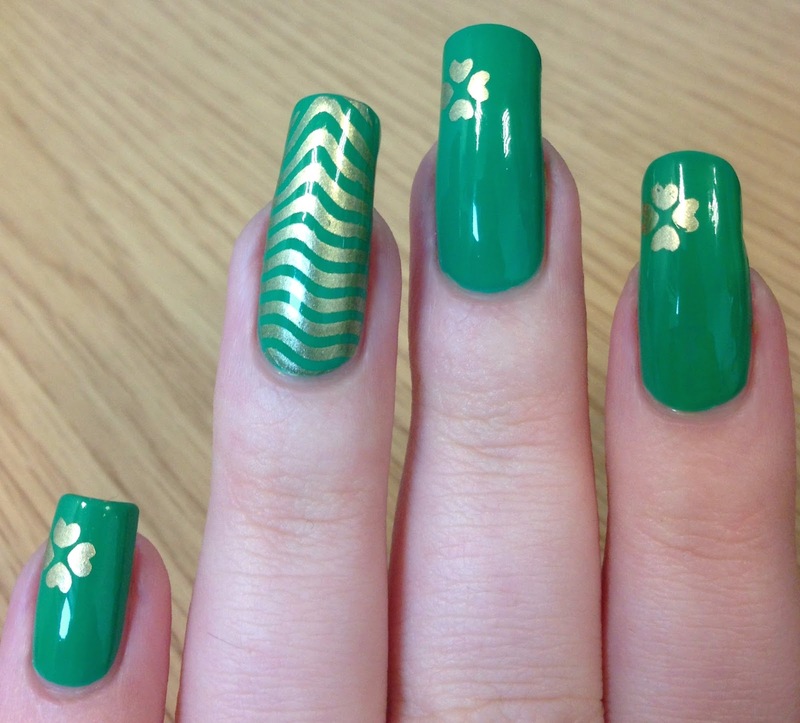 Have you done your nails for St Patrick's? I'd love to know! How do you manage to keep your nails that long without breaking any? Anyway I think Four Leaf Clover is a great color and I love your manicure. 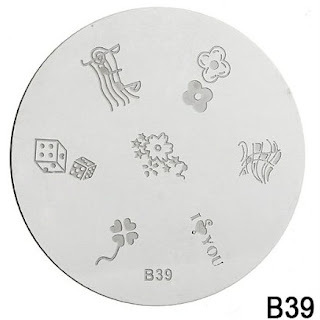 A Simple but very nice design. I love this mani! The green creme is just beautiful. Don't think this is weird, but the accent nail reminds me of a lipstick when I had when I was a kid, the case was green and swirly! I think this is such a neat and classy St. Patrick's design. it looks really well thought out. I'd never guess you did it on the fly!